Before making a phone call, check the connection status, battery charge, call area and signal strength. If a Bluetooth® device cannot be connected, check the connection status on the phone screen. If the device is not connected, either register or reconnect it. To display the screen shown below, press the switch on the steering wheel or press the button. Several functions are available to operate on each screen that is displayed by selecting the 4 tabs. The vehicle’s built in microphone is used when talking on the phone. The person you are speaking to can be heard from the front speakers. 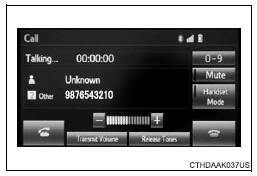 To use the hands-free system, you must register your Bluetooth® phone in the system. You can check indicators such as signal strength and battery charge on any screen. Select the “Dial Pad” tab and enter a phone number. For the first digit, you can enter “+” by selecting “ ” for a while. Press the switch on the steering wheel or select . Choose the number and then press the switch on the steering wheel or select . Transfer the contact data to the system using a Bluetooth® phone. Select to transfer new contacts from a cellular phone, select “Always” and then enable “Automatic Transfer”. Follow the steps in “Update contacts from phone” from “STEP 2”. Check that the “Call” screen is displayed. ●If you make a call to or receive a call from a number registered in the contact, the name is displayed in the call history. ●If you make multiple calls to the same number, only the last call made is displayed in the call history. The following screen is displayed when speaking on the phone. Select “-” or “+”. You can also adjust the volume using the volume knob. When using phone services such as an answering service or a bank, you can store phone numbers and code numbers in the contact. “Release Tones” appear when a continuous tone signal(s) containing a “w” is registered in the contact list. ●A continuous tone signal is a character string that consists of numbers and the characters “p” or “w”. (e.g.056133w0123p#1∗) ●When the “p” pause tone is used, the tone data up until the next pause tone will be automatically sent after 2 seconds have elapsed. When the “w” pause tone is used, the tone data up until the next pause tone will be automatically sent after a user operation is performed. ●Release tones can be used when automated operation of a phone based service such as an answering machine or bank phone service is desired. A phone number with continuous tone signals can be registered in the contact list. ●Tone data after a “w” pause tone can be operated on voice command during a call. Select “Handset Mode” to change from a hands-free call to a cellular phone call. 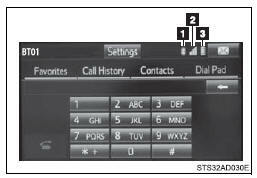 Select “Handset Mode” to off from a cellular phone call to a handsfree call. Select the desired level for the transmit volume. 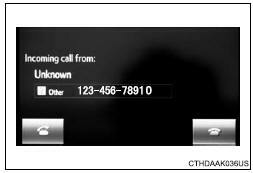 When a call is interrupted by a third party while talking, an incoming call message will be displayed. 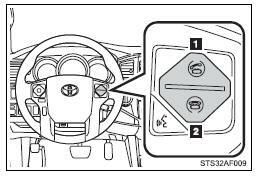 To talk with the other party: Press the switch on the steering wheel or select . To refuse the call: Press the switch on the steering wheel or select . Every time you press the switch on the steering wheel or select during call waiting, you will be switched to the other party. ●If you transfer from the cellular phone to hands-free, the hands-free screen will be displayed, and you can operate the system using the screen. ●Transfer method and operation may vary according to the cellular phone used. ●For operation of the cellular phone in use, see the phone’s manual. Call waiting operation may differ depending on your phone company and cellular phone. Press the switch on the steering wheel or press the button. Select on the phone screen. Check that the “Message Inbox” screen is displayed. E-mail: Select to check the message. Select to refuse the message. Select to call the message sender. ●The pop up screen is separately available for incoming e-mail and SMS/ MMS messages under the following conditions: E-mail: • “Incoming E-mail Display” is set to “Full Screen”. Display the “Message Inbox” screen. Select the desired message from the list. Check that the message is displayed. E-mails: Select “Mark Unread” or “Mark Read” to mark mail unread or read on the “Message Inbox” screen. Select to make a call to the sender. Select to have messages read out. To cancel this function, select “Stop”. Select to display the previous or next message. Select to reply the message. ●Depending on the type of Bluetooth® phone being connected, it may be necessary to perform additional steps on the phone. ●Messages are displayed in the appropriate connected Bluetooth® phone’s registered mail address folder. Select the tab of the desired folder to be displayed. ●Only received messages on the connected Bluetooth® phone can be displayed. ●The text of the message is not displayed while driving. ●When “Automatic Message Readout” is set to on, messages will be automatically read out. ●Turn the “PWR⋅VOL” knob to adjust the message read out volume. 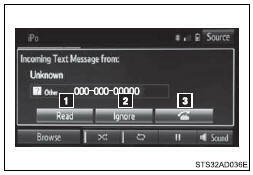 ●The message read out function is available even while driving. This operation cannot be performed while driving. Select corresponding to the desired message to edit. Select “OK” when editing is completed. Calls can be made to an e-mail/SMS/MMS message sender’s phone number. Calls can be made to a number identified in a message’s text area. Select corresponding to the desired number. 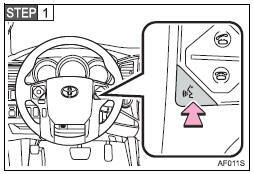 The steering wheel switches can be used to operate a connected cellular phone. You can adjust the hands-free system to your desired settings. To display the screen shown below, press the “SETUP” button, and select “Phone” on the “Setup” screen. Display the “Phone/Message Settings” screen. Select “Sound Settings” on the “Phone/Message Settings” screen. Adjust the message readout volume. Set the desired incoming SMS/MMS tone. 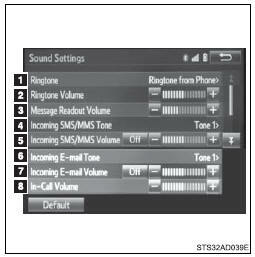 Adjust the incoming SMS/ MMS tone volume. Set the incoming e-mail tone. Adjust the incoming e-mail tone volume. Adjust the default volume of the other party’s voice. Select “Default”, and then “Yes”. 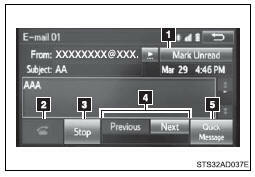 The contact can be transferred from a Bluetooth® phone to the system. The contact also can be added, edited and deleted. The call history can be deleted and contact and favorites can be changed. For PBAP compatible Bluetooth® phones, select to set automatic contact/history transfer on/off. When set to on, the phone’s contact data and history are automatically transferred. 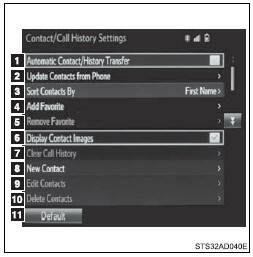 Select to update contacts from the connected phone. Select to sort contacts by the first name or last name field. Select to add contacts to the favorites list. Select to delete contacts from the favorites list. Select to display contact images. Select to clear contacts from the call history. *: For PBAP compatible Bluetooth® phones only, this function is available when “Automatic Contact/ History Transfer” is set to off. Operation methods differ between PBAP compatible and PBAP incompatible but OPP compatible Bluetooth® phones. Select “Update Contacts from Phone”. Depending on the type of cellular phone, OBEX authentication may be required when transferring contact data. Enter “1234” into the Bluetooth® phone. If another Bluetooth® device is connected when transferring contact data, depending on the phone, the connected Bluetooth® device may need to be disconnected. Depending on the type of Bluetooth® phone being connected, it may be necessary to perform additional steps on the phone. To cancel this function, select “Cancel”. Select “Done” when it appears on the screen. 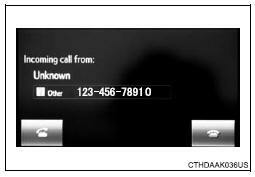 For PBAP compatible Bluetooth® phones, this function is available when “Automatic Contact/History Transfer” is set to off. Select the “Call History” tab and select a contact not yet registered in the contact list. New contact data can be registered. Up to 4 numbers per person can be registered. For PBAP compatible Bluetooth® phones, this function is available when “Automatic Contact/History Transfer” is set to off. Enter the name and select “OK”. Enter the phone number and select “OK”. Select the phone type for the phone number. To add another number to this contact, select “Yes”. Follow the steps in “Registering a new contact to the contact list” from “STEP 3”. Select corresponding to the desired name or number. Follow the steps in “Registering a new contact to the contact list” from “STEP 4”. Select the “Contacts”, “Call History” tab or the “Favorites” tab and select the desired contact. “E-mail Addresses”: Select to display all registered e-mail addresses for the contact. Follow the steps in “Editing the contact data” from “STEP 4”. Select the desired contact and select “Delete”. Select “Yes” when the confirmation screen appears. Select the desired contact to add to the favorites list. When 15 contacts have already been registered to the favorites list, a registered contact needs to be replaced. Select “Yes” when the confirmation screen appears to replace a contact. Select the contact to be replaced. Select at the beginning of the desired contact list name to be registered in the favorites list. Select the “Contacts” tab or the “Call History” tab and select the desired contact. Select the desired contacts and select “Remove”. Select at the beginning of the contact list name to be deleted from the favorites. list. Select the “Contacts”, “Call History” tab or the “Favorites” tab and select the desired contact to delete. Set automatic message transfer on/off. Set automatic message readout on/off. Set the SMS/MMS notification popup on/off. Set the e-mail notification popup on/off. Set adding the vehicle signature to outgoing messages on/ off. Set updating message read status on phone on/off. Change the incoming SMS/ MMS display. 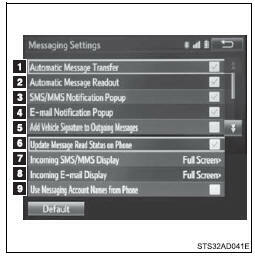 “Full Screen”: When an SMS/ MMS message is received, the incoming SMS/MMS display screen is displayed and can be operated on the screen. “Drop-Down”: When an SMS/ MMS message is received, a message is displayed on the upper side of the screen. Change the incoming e-mail display. “Full Screen”: When an e-mail is received, the incoming e-mail display screen is the displayed and can be operated on the screen. “Drop-Down”: When an e-mail is received, a message is displayed on the upper side of the screen. Set display of messaging account names on the inbox tab on/off. 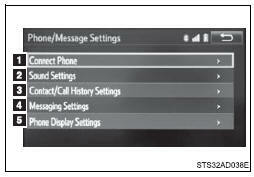 When set to on, messaging account names used on the cellular phone will be displayed. Change the incoming call display. 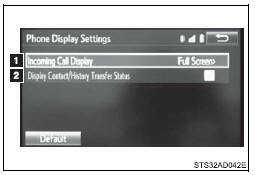 “Full Screen”: When a call is received, the hands-free screen is displayed and can be operated on the screen. “Drop-Down”: A message is displayed on the upper side of the screen. 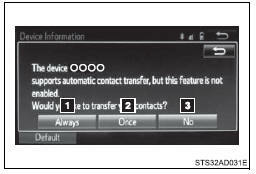 Set display of the contact/history transfer completion message on/off. Operations of the voice command system can be performed by selecting the menu corresponding to each function on the screen. Even if any menu is selected, commands displayed on all menus can be operated. After a beep sounds, say the desired command. ●Voice commands may not be recognized if: • Spoken too quickly.